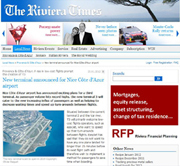 Mention the name Nice and even people who've never been there have a mental picture of this iconic Riviera resort with its shining super yachts, smart hotels, historic buildings and fashionable boutiques. 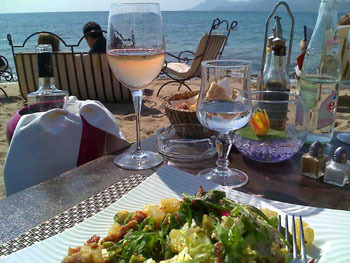 Nice epitomises the elegance and affluence of the south of France and yet the city has only been French for 150 years. In June 1860, it was handed over to Emperor Napoleon III by Victor Emmanuel, leader of the state of Savoie, in return for military support. This year, the anniversary is being marked with 150 individual community projects, all aimed at making this delightful city even more attractive. Facades will be renovated, gardens landscaped and buildings restored, so if you've never enjoyed the unique atmosphere of France's fifth largest city, there couldn't be a better time to visit. 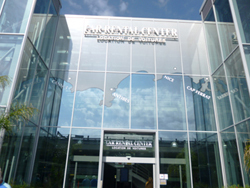 The city is easily accessible from the UK by low cost flight or by train via Paris. 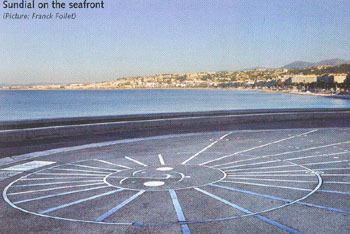 Left: cadran solaire Sundial on the seafront (Picture: Franck Follet) Nice was founded by the Greeks who established a strategic trading post, Nikaia, on the hill above the bay during the 4th century BC. 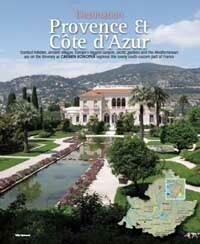 Today La Colline du Château is a must for first-time visitors, a shady vantage point that offers fabulous views over the yacht marina and ferry port in one direction, and the terracotta tiles of the old town and the Mediterranean promenade in the other. The Romans followed the Greeks, establishing their own town of Cemenelum on Cimiez hill behind the shore. 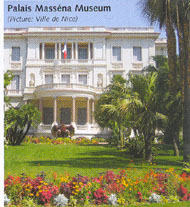 Today their ruined buildings are just a bus ride from the city centre, close to the 17th century Genoese villa which houses the popular museum dedicated to the artist Matisse, who came here as a young man and never left. 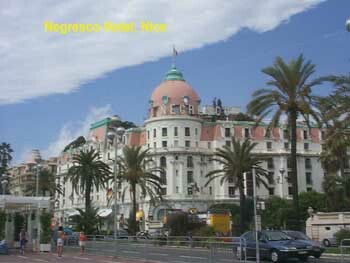 But it was the Brits who put Nice firmly on the tourist map, turning it into an essential stopover for the wealthy and wannabes of the 19th century. The footpath around the Baie des Anges - the aptly named Bay of Angels - was widened in 1820 by an Englishman, Reverend Lewis Way. 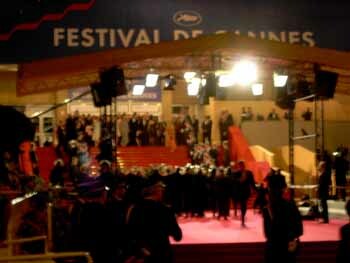 Palm trees and pergolas followed and soon the Promenade was the place to see and be seen. 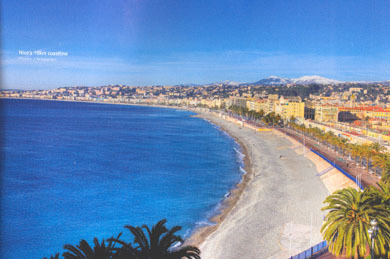 Left: vue Nice - Nice's 10km coastline (Picture: J Kelogapian) Today the 10km city coastline includes 7.5km of beach - 15 private beaches as well as ample public areas - and the Promenade is reserved for pedestrians, cyclists and roller skaters. As it sweeps eastwards towards the site of the first Greek settlement, this stylish street morphs into the Quai des Etats-Unis. Elsewhere in the city, the visiting Russian aristocrats are remembered through their opulent domed cathedral and villas. 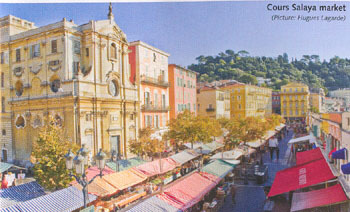 Left: bord de mer Bay of Angels (Picture: Ville de Nice) Behind the Quai des Etats-Unis lies the Old Town, another must-see for Nice novices, but a corner of the city that repeatedly draws in seasoned visitors with its Baroque churches, balconied buildings and hidden courtyards. Enjoy people-watching from a pavement café and strolling the flower stalls of Cours Saleya - every day except Monday when antique sellers replace the florists. Left: marche fleurs - The flower market (Picture: Hugues Lagarde) Nice boasts one of the most important concentrations of antique shops in France, packed in between the port and Rue Ségurane. In fact the town centre is packed with all sorts of tempting boutiques to part you from your money, but Nice doesn't have to blow a hole in the budget. It may have ultra-chic hotels like the historic Hôtel Negresco on the seafront, but my student daughter bagged a bargain room in a city centre hostel just a couple of blocks away and had huge fun. 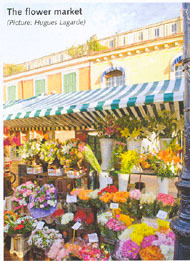 Left: marche fleurs The flower market (Picture: Hugues Lagarde) There are restaurants to suit all pockets from Michelin-starred establishments to good-value brasseries and wine bars. Or pick up a budget snack on the move at one of the many street stalls and fast food outlets. Bypass ubiquitous MacDo in favour of a Niçoise speciality such as pan-bagnat (a small round loaf drizzled with olive oil and packed with tuna, salad and black olives); pissaladière (onion tart with anchovy fillets and black olives); or socca (a thin pancake cooked on a wood-burning stove). Culture can also come cheap. 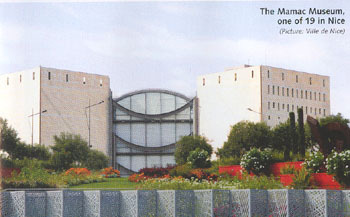 Choose from 19 museums and galleries - the largest concentration after Paris - which together cover a wide range of styles and periods. 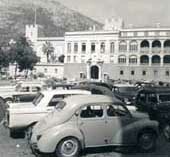 Admission to all municipal museums is free, but some close Mondays and others on Tuesdays, so check before you travel. 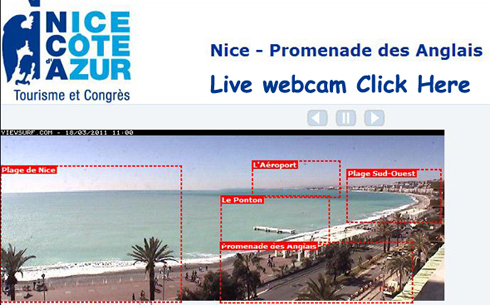 Nice is an easy city to explore on foot or public transport. Ride the new tramway system which passes 13 monumental sculptures, all specially commissioned to enhance the route and illuminated after dark. As night falls, treat yourself to a night at the opera, enjoy a recital by the Nice Baroque Ensemble, or get into the groove at a jazz concert. Or simply stroll beneath the lights of the Promenade des Anglais and listen to the soothing sound of waves lapping the shore. 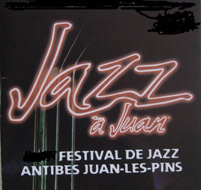 Visit in February to enjoy two weeks of parades and partying at the annual Nice Carnival, but there's a wide variety of atmospheric events across the year including an arts and crafts market along Cours Saleya on summer evenings. If you can linger longer, Nice lies at the gateway of the spectacular Mercantour National Park, a paradise for hikers and adventure sports enthusiasts. Discover the fascinating relationship between man and wolf - past and present - at the Alpha wolf park in St-Martin-Vésubie or take the Train des Merveilles from the city centre for a picturesque ride through the mountains towards Tende. But with so much to do in this captivating city, you may have to leave outside temptations for another time. 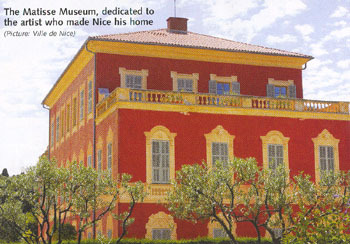 And there will be another time, because one visit to Nice is never enough! ©Article - Destination France - March 2010 ©Photographs by arrangement with Destination France and credits by each individual photograph.